Shell-pink and pearly alabaster hues absorb the light and softly reflect it back from the lusciously round body of the Opal Table Lamp. The clear acrylic base and finial enhance the ethereal feel of this stunning piece with its creamy hand-applied amber finish. This is one of our offerings created by artisans, which means no two are exactly alike. 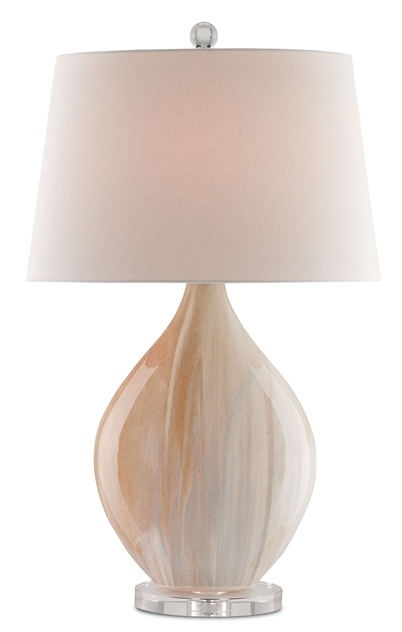 The glow emitting from the off-white linen shade completes the rosy countenance of this stunning lamp. Takes one 150 watt max bulb (not included). Shade Measures: Vanilla Linen, 15.5/10" x 19/11.5" x 12"
Ships out in 1-2 weeks. Ships common carrier. Eligible for return or exchange with 15% restocking fee. Please view our return policy for more information.